I have an addiction to cookbooks! I tell myself I am not going to purchase any new cookbooks but then I see a new one and I can’t help myself. Usually it turns out to be a good decision and I rarely have regrets. I read cookbooks like novels cover to cover, soaking up all of the authors hints, tips and thoughts about cooking. I feel like I get to know them and their families through their cookbooks. What is even more amazing is that the internet allows me to have contact with some of the cookbook authors. Many authors are active on Instagram and facebook. You can let them know how much you love their recipes, ask questions, post photos of your interpretation of their recipes and get their feedback. This type of interaction makes cooking from cookbooks more exciting and fun! Sometimes they ask if they can re-post your photos on their IG and facebook pages. I love it! One of my latest cookbook purchases was The Prevent and Reverse Heart Disease Cookbook from Jane Esselstyn and Ann Crile Esselstyn. You can find it at your local book store or on this Amazon link.No I don’t have heart disease and I don’t anticipate having any in the future either. Following a whole foods plant based diet is all about eating healthy and preventing heart disease, diabetes and reducing the risk of developing cancer. My thinking is that it’s easier to prevent against these diseases to begin with rather than waiting to get sick and then changing your lifestyle. I’m not paranoid about getting ill nor do I obsess about it, I just think it makes sense to adopt a healthy lifestyle and manage my health as best I can through diet and exercise. The Esselstyn family follow a heart healthy diet and they travel the country sharing their knowledge and helping to educate people on how to change to a plant based lifestyle. Caldwell B. Esselstyn, Jr. MD published his Prevent and Reverse Heart Disease in 2007 to share his research which showed that patients with significant coronary artery heart disease could stop and even reverse their illness by changing their diets. If they avoided oil, meat and dairy and instead choose a whole food plant based diet they could become healthy again. Plant based nutrition can prevent chronic disease! The recipes in this book have been amazing. Super easy to make but big on flavor. I have been serving up these delicious new recipes to the family. Banana Steel Cut Oats which I served with my own Chia Jam for breakfast – fast easy and filling. The Eat Loaf which is jam packed with oats, beans and veggies. The recipe makes two loaves to feed a crowd or perfect for cooking ahead for the week. It bakes with a layer of BBQ sauce in the bottom of the pan as well as on top. Sooooo yummy. The Magnificent Mushroom Ragout has a deep earthy flavor and it can be used in so many ways. I served some over the Eat Loaf, daughter Katy used some to top off some soup, perfect over a baked potato and just as a side dish. I also think it would be fabulous over a bed of polenta. 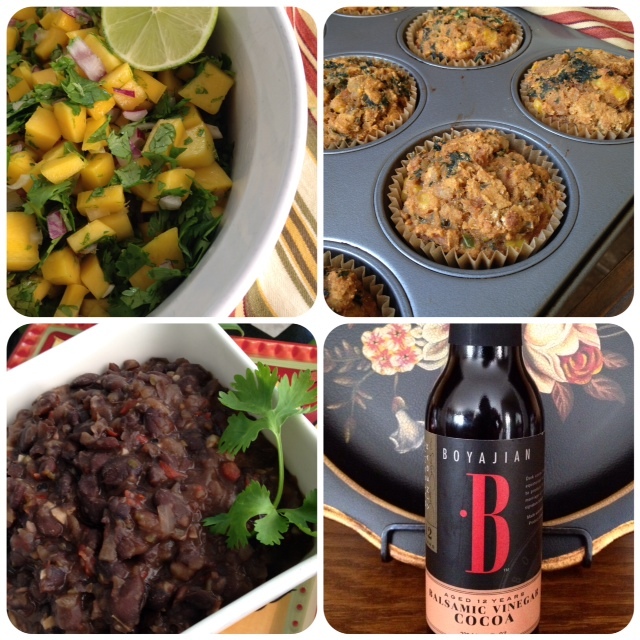 The Mango Lime Salsa was a big hit here – so fresh and flavorful. A perfect side dish to the most amazing Mexican Style Beans I have ever made. The recipe is called Matt’s Sofrito Black Beans on page 209. You start with dried black beans which I made in my slow cooker then you add onions, peppers and seasonings which gives these humble beans so much depth and flavor. They were a huge hit with my family – yes even the omnivores devoured them. Now my daughter uses this recipe all the time and people always ask for the recipe. The cookbook is worth the price just for this recipe alone! Jalapeno and Salsa Corn Muffins taste a lot like a tamale but with tons more nutrition. They stand on their own but will surely be enjoyed along side big bowls of plant based chili this winter. I had no idea about chocolate balsamic vinegar until I saw it listed as an ingredient in some recipes in this cookbook. I found a bottle of it at my local Nugget Market – a kind of specialty grocery store. Wow is it ever tasty. You can drizzle it over some fresh berries or on top of fruit based desserts. Yum! Updating 10/16/2017 to say that if you follow Chef AJ’s Ultimate Weight Loss program the muffins and chocolate balsamic vinegar are not compliant on the program. I highly recommend this cookbook for anyone who loves healthy delicious food. There is a nice section in the front of the cookbook all about how to stock your pantry with hearth healthy foods. There is a Q & A with Dr Caldwell Esselstyn JR., MD which will answer many questions you may have about a whole foods plant based diet. I love the photos of the recipes – it helps me decided what to make first and makes the recipes even more enticing. When I started to bookmark recipes to try I soon realized that I actually wanted to make just about everything so I stopped marking the pages! Eating a plant based diet isn’t about deprivation – quite the opposite. There are so many incredible food choices that I really don’t miss animal products in my diet. It is a big change initially from the mainstream SAD – Standard American Diet but it’s so easy once you make the change. I have tried even more recipes so here is a run down of all them to date! 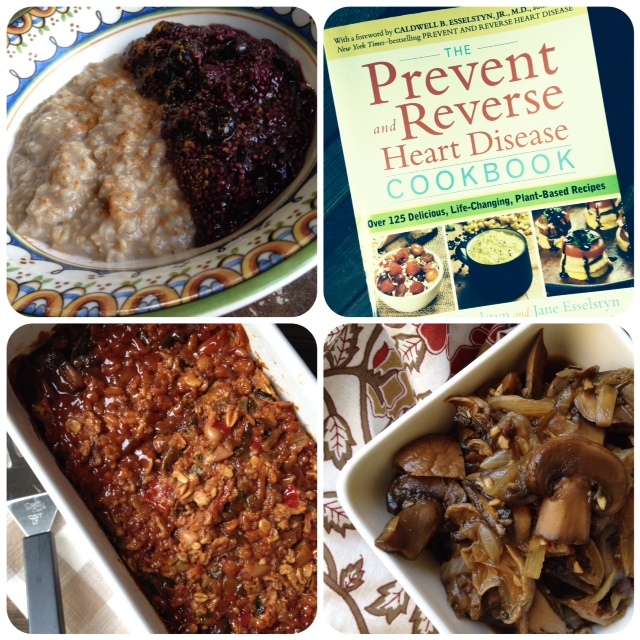 Someone asked me what recipes I have tried from The Prevent and Reverse Heart Disease Cookbook so I thought since I had already typed this up I would share it with everyone. It really is one of my favorite cookbooks and there are so many recipes in it that fit into the UWL program. Just skip over the other recipes in the book. The only recipe I have tried from The PRHD cookbook that I wasn’t crazy about was the Reboot salad but my hubby loved it and most of it by himself over a few days. I hope this helps you, I was shocked at how many recipes I have tried! Good luck with your cooking – it’s nice to have some variety. *Eat Loaf pg 184 it makes two loaves and I cut one into individual servings and freeze it, pg 184 its awesome! Use Shayda’s BBQ Sauce – the recipe is in the files here on the facebook page. *Mango Magic with Raspberry Sauce pg 250 but I added chuncks of fruit to it to give it some body otherwise it was too thin and runny, it was good. You can get a few sample recipes for free as the Esselstyn’s have shared them on their web site. If you use my Amazon link I do get a small residual which helps fund this blog. I will be sharing more photos of my culinary creations from this cookbook. It would be awesome if you have the cookbook and would like to cook along with me. We can compare notes on the recipes and encourage each other as we explore more about eating healthy. You can find the cookbook at your local book store or on Amazon. If you follow me on facebook or Instagram you can also see what’s cooking in the Nutmeg Notebook kitchen. I haven’t had as much time in the kitchen lately as I would like. We have been spending a lot of time at our daughter Katy and son in law Esau’s house. If you read my last post you know they bought a two year old house nearby that needed some TLC. They ended up firing the painter – to make a long story short – he was so sloppy – we have been cleaning up the disaster he made and repainting everything! Just about everything that could go wrong has gone wrong. Did you ever see that movie called The Money Pit? We feel like we are living that movie! The good news is we are good painters – just very slow. What we have painted looks amazing. The house is being completely transformed. New carpet and other flooring will be installed the end of next week so we are working against a deadline. I feel the pressure – but we can only do what we can do. In addition to painting I have been helping Katy grade papers – an English teacher has a ton of papers to grade. A teachers work is never done – they are so underpaid! That’s a wrap for today. I am headed over to the house to paint! Does anyone want to get this cookbook and cook along with me? Previous Post: « From Empty Nest to Full House! Thanks for sharing your opinions of the new Esselstyn cookbook! I was debating putting it on my wishlist, as Engine 2 recipes tend to rely more on processed items like breads, pasta, tortillas, etc, than I like to use. It seems this cookbook looks really homemade and plant-based! I was never a fan of meatloaf growing up, but your picture makes me want to try their Eat Loaf! The recipes in this cookbook are not using many processed products. They do use some potatoes and there are recipes with the option of using whole grain tortillas for tacos or wraps but I think most of the recipes would work well with a nutritarian food plan. They are oil free and mostly salt free and use maple syrup for sweetness in some dessert recipes. The Eat Loaf is wonderful! Sounds like a very nice cookbook! I still have a few cookbooks I need to actually use (cook from), but if I decide to get this one, I’ll let you know! I have been watching your posts on facebook and was going to ask about your recommendations for a cookbook with plant based recipes. Would you recommend this one for a relative novice? I was also wondering about the WW points based program and this cookbook as I started following your blog when you were more WW based. Really enjoy your blog and posts. Great questions. This cookbook and most plant based cookbooks don’t have the nutritional information for the recipes so if you want to count points you would have to calculate the stats for yourself. I gave up counting WW points some years ago when I cleaned up my food plan and eliminated most of the non nutritional food. There is a plant based/vegan cookbook called Recipes For Reduction by Isa Chandra Moskowitz and it does include nutritional information. I have enjoyed everything I have made from it. She does include salt oil and sugar in her recipes but I modify them to my needs. Her cookbook called Isa Does It is also amazing but the recipes are higher calorie and no nutritional information. and my daughter also have her cookbook and everyone loves her recipes but there is no nutritional information included. What cookbook to start with kind of depends on where you are with your food plan and if you are wanting to start transitioning away from animal products or do you just want to add some meatless meals to your diet? Dr Fuhrman’s books do include nutritional information and I actually love his recipes! His book titled Eat For Health is very informative and includes recipes as well as a staged plan for reducing the amount of animal products in Your diet and why it’s important to do so. I also like his book The End Of Dieting. Let me know more about how you are eating now and what you would like to achieve in terms of change and I will offer my book suggestions! Thanks for the reply and ideas. We are currently trying to “eat healthier” whatever that means right? Looking to decrease cholesterol, stay off meds,feel good. I do a meatless meal on my day off when I have extra time, and sometimes several days of meatless if its a soup or easy weeknight recipe. Dont mind extra time for some recipes, but also need some quick to put together ones.But we also eat meat, and I am on maintenance for WW so try to keep it somewhat calorie/ point controlled as well. Seems like some of the older vegetarian cookbooks I have are heavy on the oils. We don’t live in CA so not always quite so easy to find the beautiful fruits and vegies all year long. It sounds like you are doing a great job of eating healthy! There is nothing wrong with frozen veggies and fruits – they can play a big part in a healthy diet and reduce waste since they don’t go bad. If you want to be able to count the WW points then I would suggest you go with Appetite For Reduction by Isa Chandra Moskowitz or one of the books by Dr Fuhrman since both include nutritional information and that will be helpful for the way you are used to keeping track of what you are eating. You can preview them on line on Amazon or at a book store. Some public libraries might have them and then you can see what the recipes are like and determine if they appeal to you. I haven’t been on the WW message board in a couple of years but there used to be a vegetarian board on there that I liked to follow. The people who posted were counting points but without any meat in their diet. They still used dairy products and perhaps eggs – I don’t exactly remember now. There are lots of quick and easy plant based recipes here on my blog. Check out my favorite plant based recipes post http://nutmegnotebook.com/2014/02/my-favorite-plant-basedvegan-recipes/ These are the recipes that I make again and again! Keep in touch and let me know if I can be of any further help to you! Tami–I’m so excited, I just purchased this cookbook! Looking forward to downloading it later today! I used your link too!!! 🙂 I’m really excited to try some of these amazing dishes. Thanks for sharing! I think I will start with this one and branch out in the future!